Our day trip leads you to the famous Halong Bay and through the most attractive areas... Read more! Ha Long Bay, located in the Gulf of Tonkin, covers an area of 1500 square km. With... Read more! 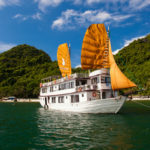 Discover Halong Bay aboard the Alova Day Cruise, a wooden Asian junk that combines... Read more! Together with luxurious 21-cabin Victory, Bai Tho Co.,Ltd launched the smaller... Read more! 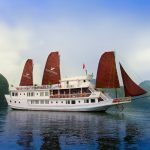 Paradise Privilege is an invitation for you to cruise around Halong Bay onboard your... Read more! 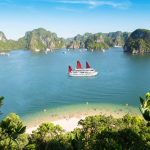 Princess cruises is designed in the style of the traditional sailing boats of Halong... Read more! Itinerary: Our tour package come with 2 options Option 1 – 3 star accommodation:... Read more! 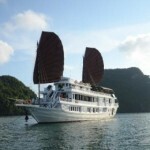 A gorgeous cruise of Huong Hai Halong which is newly launched in February 2013. Huong... Read more!